Neymar’s touchline drama against Mexico has angered a number of football fans. Brazil were up against Mexico in the round of 16 of the World Cup on Monday. The 2014 hosts were made to toil hard, but Neymar and Firmino scored in the second half to seal their spots in the quarter-finals. But one incident has caught the eyes more than Brazil’s victory. Neymar is a well-known dramatic footballer, but his antics went to a whole new level against Mexico. Miguel Layún, who came on at half-time, accidentally stepped on the Brazilian’s foot as he went to gather the ball for a throw-in. But the 26-year old turned it into a huge scene. 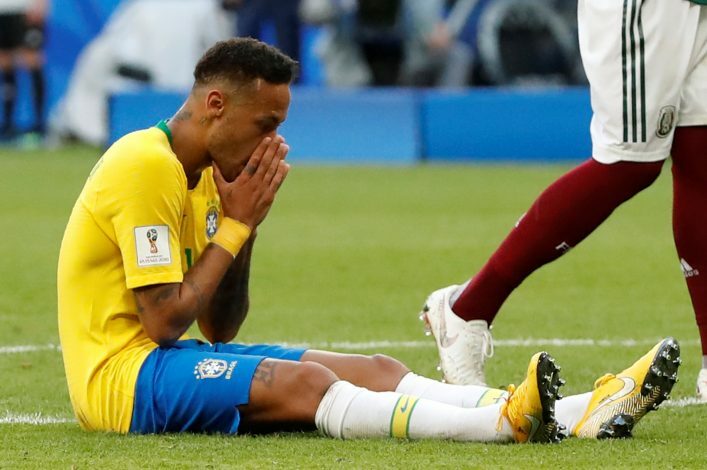 Neymar went down as if he took a major blow and seemed like his World Cup was over. It took him minutes to get up and play on as normal, which angered football fans around the world. VAR had a look at the incident and realised that it was just another act from Neymar. Two English greats, Lineker and Shearer, took to Twitter to make fun of Neymar’s poor sportsmanship at display. Fans took to Twitter to express how pathetic Neymar made a meal of just an accidental stamp. That is utterly pathetic from Neymar. He's just embarrassing to watch. Impossible to warm to him. And not to forget the memes that followed. Isn’t this the best one for the situation?